A village in highland Perth and Kinross, Comrie lies 7 miles (11 km) west of Crieff where the broad valley of Strathearn narrows at the confluence of the Ruchill Water and River Lednock with the River Earn. Its name is derived from the Gaelic for the 'confluence of streams'. In 79 AD Agricola built one of his Highland line of forts here, calling the place Victoria. 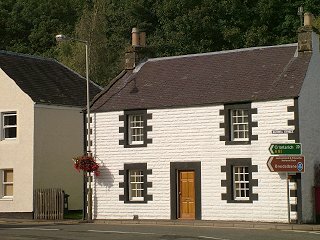 It later developed as a kirktown that expanded in 1796 with the influx of dispossessed Highland crofters who came from Glenlednock to work in the village's distillery and two breweries or as handloom weavers. Between the Earn and Ruchill lies The Ross, a former crofting and weaving community that is still accessed by a stone bridge built in 1792. To the south of the Earn is the 'suburb' of Dalginross, formerly a separate village. A prominent landmark is the White Church (1805) which has served as a lively community centre for the village since 1965. It is now the focal point of the New Year Flambeaux procession, originally performed to drive evil spirits from the village. At the head of Glenlednock are a reservoir and hydroelectric dam and on the summit of Dunmore overlooking Comrie is a monument built in 1812 to commemorate the first Lord Melville, Henry Dundas, who was Lord Advocate and Home Secretary under William Pitt the Younger. To the west of the village is Aberuchill Castle (1602) and to the south are the former prisoner of war camp at Cultybraggan and the Auchingarrich Wildlife and Highland Cattle Centre. There are scenic walks to the north towards the Deil's Cauldron waterfall and Laggan Wood. The village has hotels, a caravan park, bowling green, public library and a 9-hole golf course.